Europe has always been a melting pot of civilisations, cultures and languages. Genetic studies clearly reveal those things and showcase the formation of the European nations as we know them today. The peoples of these nations are formed themselves from a mixture of other ethnic groups which once inhabited a certain territory and afterwards left a trace on a country’s history (be it a cultural one, a linguistic one or even the genetic one we are actually speaking about). To better understand the history of all European peoples and their culture, one must undoubtedly take a closer look at the very grain of their origins and so to analyse the process of ethnogenesis. In terms of genetics, a nation is characterised by two types of haplogroups: Y-chromosomal (stemming from the paternal side) and the mtDNA (mithocondrial DNA stemming from the maternal side). Recently, a group of experts from Oxford University and University College in London published an interactive genetic map where you can discover the admixture of the world’s populations during the last 4,000 years. Any maps for X or X2B? What’s got to do Lithuanians with Romania? 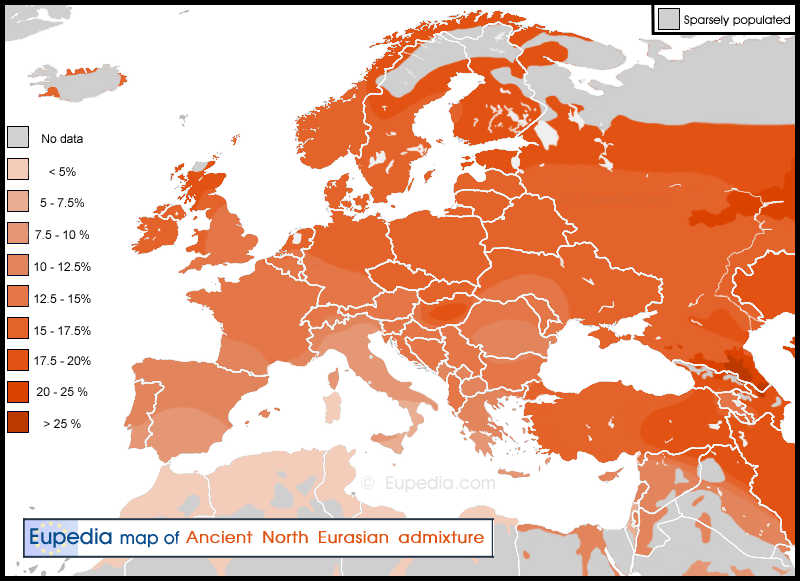 During the ice age, Scandinavians and others moved south to the Balkans .After the ice age, many moved north again…Lithuania included. 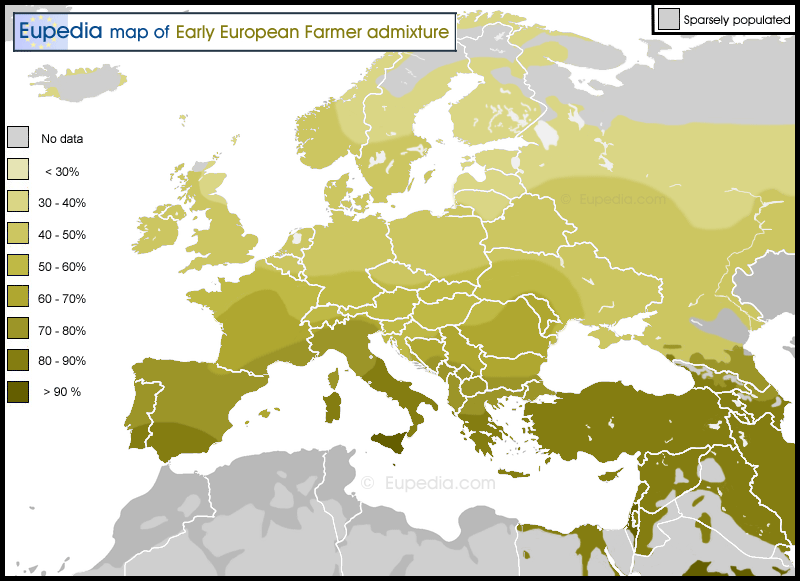 Intriguing research into the genetic distribution across Europe and western Asia. Looking forward to follow-up research. Carried out from an English university, only 6 specimens from England, no clear indications for admixture! Looks too, uhm, biased? Haplogroup I is older the 5000 years. The division between I1 and I2 is estimated to have taken place approximately 28,000 years ago. 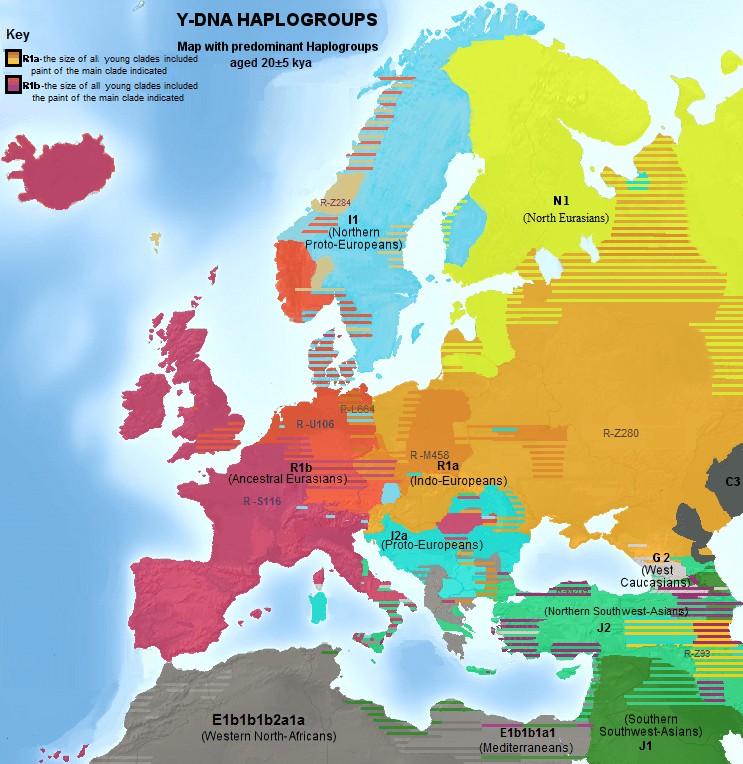 Where are the mitochondrial haplogroups? They are as equally if not more important than the than the Y DNA haplogroups. I would like to see a map of the mitochondrial DNA haplogroups. 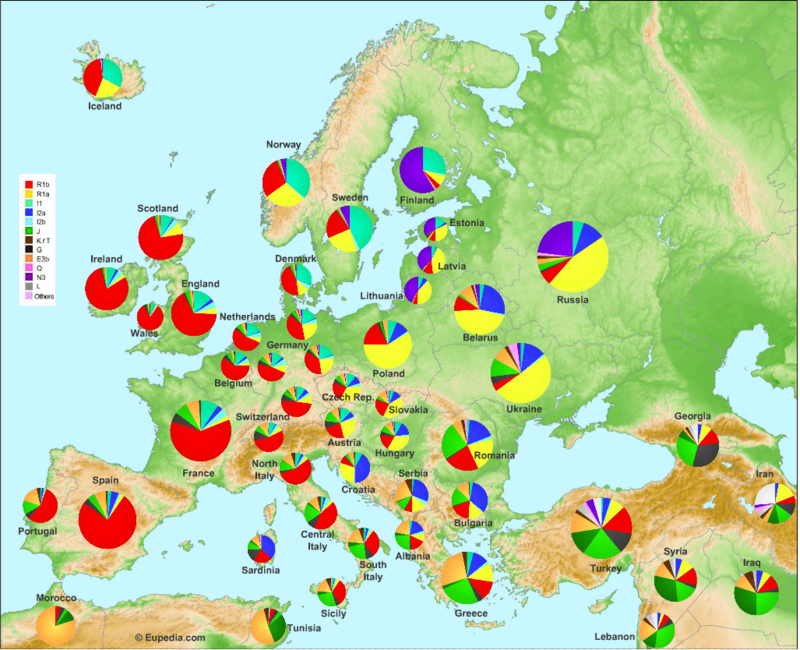 mitochondrial DNA haplogroups are almost the same all over Europe. Do you anything about H1c22? It is X DNA haplogroup. 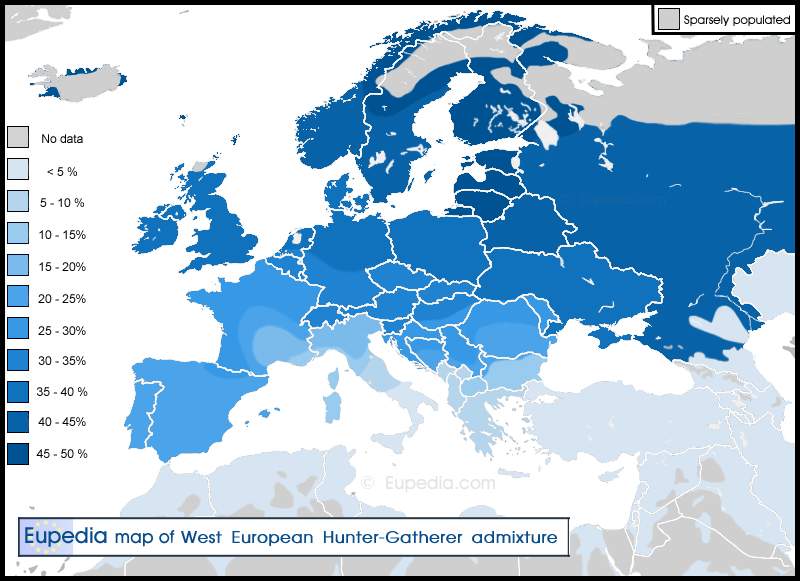 I am just wondering probably you know where this haplogroup dominates? Or probably you know anything from what X-DNA halpogroup types it consists of? Your map is mistaken for Hungary. We are N1C1-s. Tested for it. I would consider repairing on the map. Our history has no origins with Russian roots. 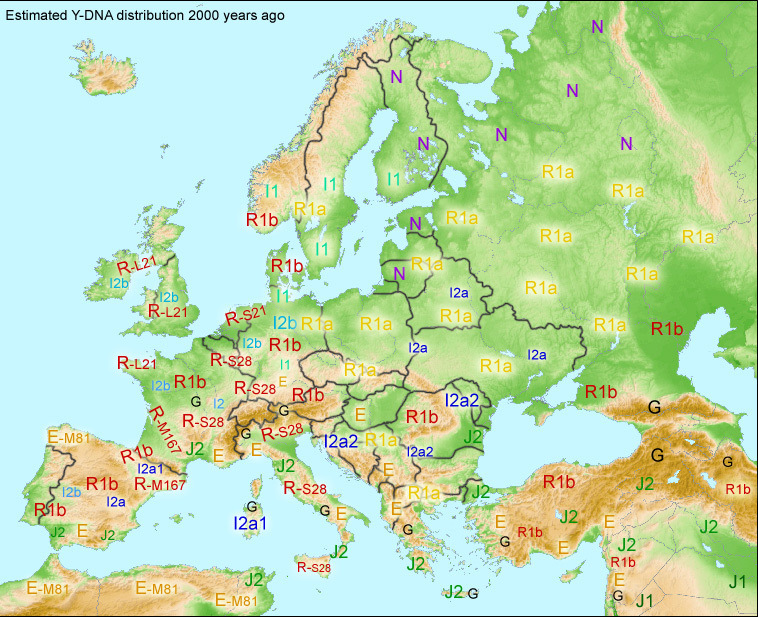 Why do you show the dominant Haplogroup of Austria as R1b while in this map its R1a? Either one of you must be wrong.